The Infernal Battalion is a glorious, tense, fantastic ride to an enormously satisfying conclusion. It’s hard to imagine Wexler could’ve written a better finale for the Shadow Campaigns. I loved this series, and the ending did not let me down. A new post over at Tor.com. Spoiler: I really really really like this book. And its series. Django Wexler, The Mad Apprentice. Corgi, 2015. Copy courtesy of the publisher. 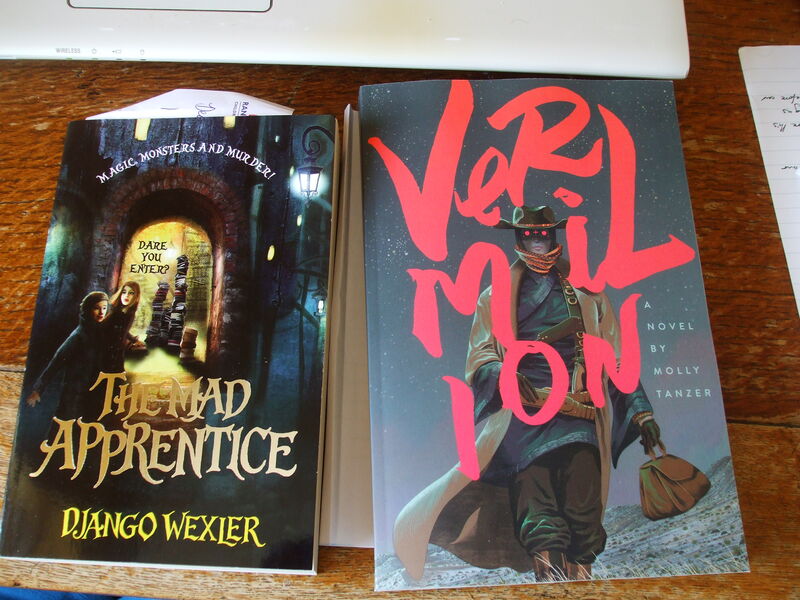 In addition to writing pretty decent epic fantasy, Wexler is also writing fun, engaging books for the 8-13 set. The Mad Apprentice is a sequel to last year’s really enjoyable The Forbidden Library. Alice, apprenticed to a Reader (an almost-immortal magician whose power comes in some peculiar way from books), is sent on a… I suppose it is a quest, along with the apprentices of her master’s allies. Their mission? To find and bring back an apprentice who seems to have killed his own master, and who is now hiding in that master’s stronghold. But the stronghold is a labyrinth, and within it Alice will discover several unpleasant truths. It’s a lot of fun. Definitely worth the read. 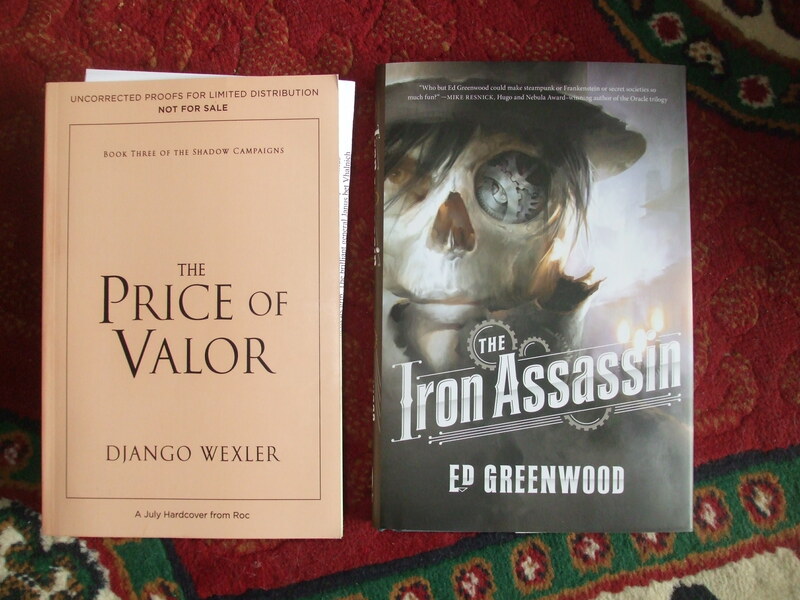 Django Wexler’s THE SHADOW THRONE. 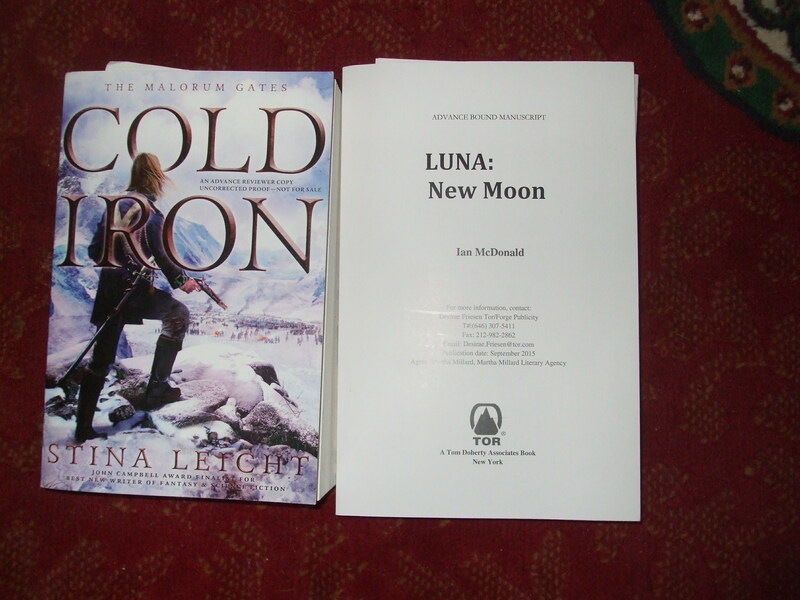 I have also received review copies. An electronic review copy of KALEIDOSCOPE, a YA anthology, and a paper copy of Paul Kincaid’s CALL AND RESPONSE to review for Strange Horizons. Sweet godless heavens, so much work. 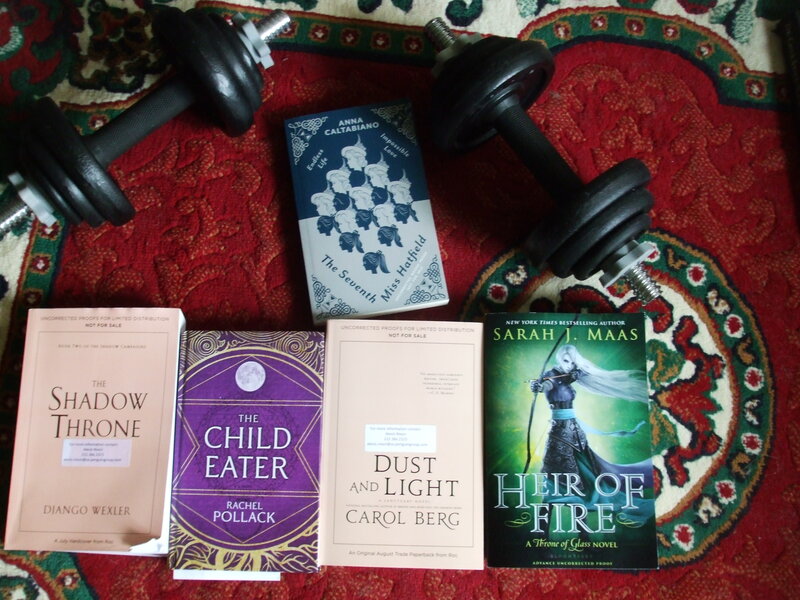 That’s Anna Caltabiano’s THE SEVENTH MISS HATFIELD, Django Wexler’s seriously entertaining THE SHADOW THRONE, Carol Berg’s DUST AND LIGHT, Rachel Pollack’s THE CHILD EATER, and Sarah J. Maas’s HEIR OF LIGHT. Three of these I’m on the hook to review for Tor.com. We’ll see where the other two turn up. I read Django Wexler’s The Forbidden Library back-to-back with Sophia McDougall’s Mars Evacuees. They’re very different books, albeit aimed at the same age-group (9-12). The Forbidden Library is a fantasy novel set in a version of Earth around the turn of the 20th century. Alice Creighton overhears her father having an argument with a fairy. Soon after, her father leaves on a journey, his ship sinks, and Alice is brought under the guardianship of a man called Geryon, who almost certainly doesn’t have her best interests at heart. She learns that she has magical powers in a dangerous and forbidding library, and struggles to learn the truth about what really happened to her father. Mars Evacuees is a novel set in a near-future Earth that’s been invaded by aliens, the Morrors. Alice Dare, daughter of ace pilot Stephanie Dare, is evacuated to not-properly-terraformed-yet Mars with a group of other young adolescents. But things go wrong on Mars, and Alice and a small group of others must make a dangerous journey alone across the planet to seek help. 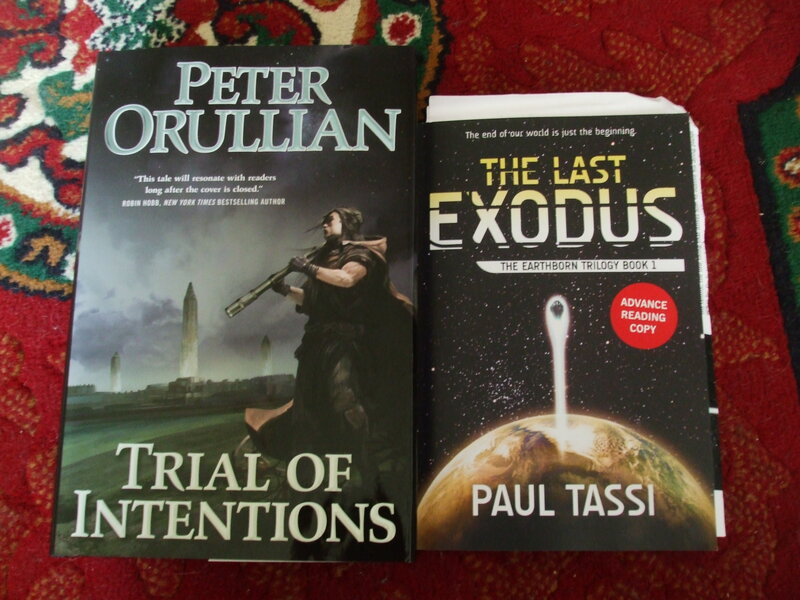 Both of these books are an awful lot of fun, although Mars Evacuees is really more My Thing. I recommend them both. 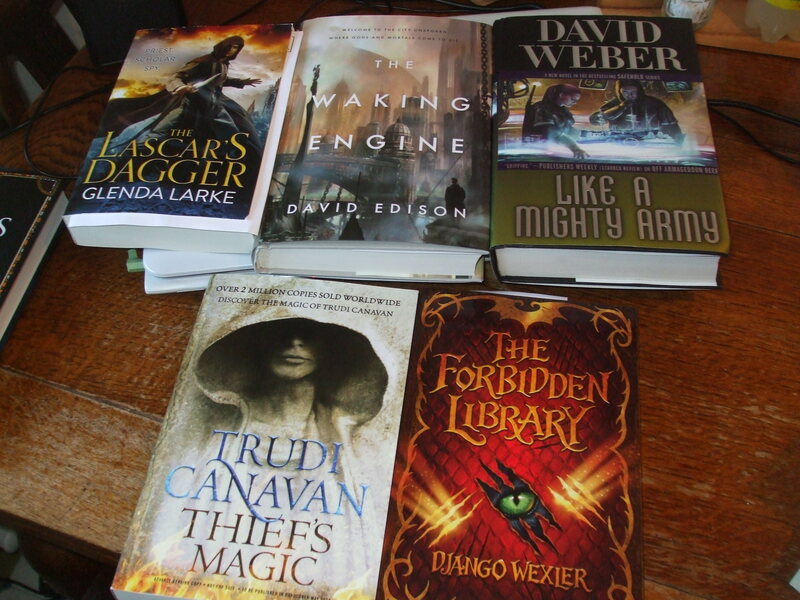 That’s Glenda Larke’s The Lascar’s Dagger, David Edison’s The Waking Engine, David Weber’s Like A Mighty Army (I got an ARC of that back in January and reviewed it for Tor.com, I don’t know why Tor’ve sent me another copy, unless it’s just that they sense my shelves need more symmetry and silver leaf), Django Wexler’s excellent-looking The Forbidden Library, and Trudi Canavan’s forthcoming latest. 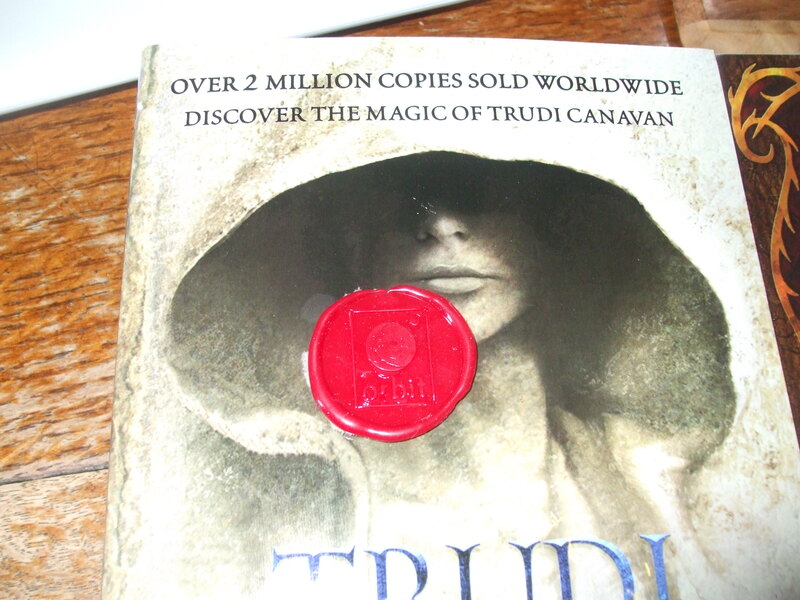 Gloomy hood cover with red wax seal.